My meals have become so simple that I hardly think of them as something worthy of blogging about. Mostly I live on combinations of the four plant-based food groups: vegetables, fruits, grains, and beans–tossed with a little seasoning, sauce or dressing– into a bowl. The longer I do this, the less I feel like developing any of it into a finished recipe. It’s more like an improvisation based on what tastes I feel like combining that day. In a way, it reminds me of a wonderful book on improvisation theater I read decades ago, called Something Wonderful Right Away. Sometimes I wonder how in the world these simple creations can be interesting to others who read or visit my blog. I’m still always amazed when someone leaves a comment and says they actually made something I posted and they love it. I’m not cooking for a family on a regular basis, so I don’t always have interest in trying to create plant-based versions that resemble Standard American favorites. I am also pretty lazy when it comes to staging my food photos, so in the end I hope my sense of play and wit and my tendency to combine flavors and textures in unique ways will win the day. 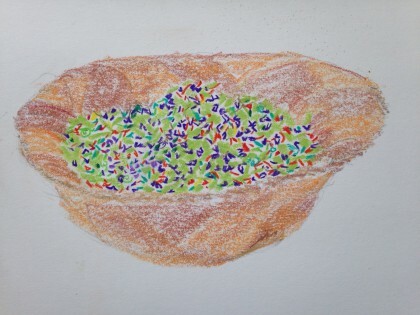 In the spirit of that play and wit and my love of puns, this blog post was going to be called simply “A Salad Foundation.” I was going to have you guess from the stylized drawing you’ll see below what vegetables I had whirred into confetti in my food processor for the foundation of a crunchy bowl of lunch. And then something magical came across my computer screen that gave my silly playfulness with simple foods a surprising layer of significance. It was International Women’s Day. 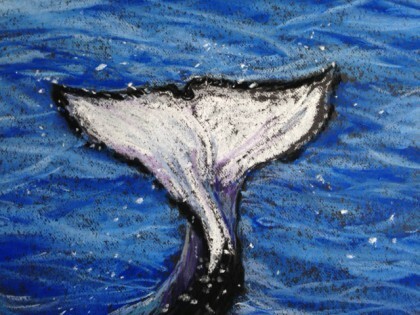 A wonderful poet friend of mine posted this article about menopausal orca whales. I was spellbound. Did you know that along with humans, these and another species of whales seem to be the only ones in which females routinely live long past their child-bearing years? And that some female orca whales live to be 90? A 35 year long study revealed that these post menopausal female orcas play a crucial role in teaching the younger members of their family how to find food sources, especially in years when salmon populations are low. Scientist are now realizing that menopause has a profound evolutionary purpose and leadership significance for these whales, and that the origin of menopause in humans likely has similar significance and purpose. While it has been suggested (outrageously and erroneously, to my mind) that menopause in human women is simply a by-product of living longer due to modern medicine, the “mounting evidence” shows that instead it is “adaptive,” and that in hunter-gatherer societies, menopausal women may well have contributed “another key commodity–information” about food sources and preparation. Thus, in our own evolutionary journey, women have lived long lives past childbearing years, often longer than men, in order to pass on the same kind of wisdom the female whales pass on to their successors. Suddenly I flashed on my my blog posts as records of the modeling I have done for my family, my friends, my town and on the internet about how to eat and cook with simple whole plant foods and thrive. While I love the sense of play I bring to my food, it often makes me giggle to think how silly or bizarre it may seem to folks with more conventional taste buds to entertain the notion there is “life beyond chocolate,” or that kale or broccoli can be eaten in sugar free baked goods, or even that there can be a sugar free and even flour free baked good that does not taste like cardboard. But when I think of the orca matriarchs, my food play seems not only blessed with silliness and innovation, but with the wisdom of how to feed oneself well on precious little–when the “salmon” are no longer an option. I knew I was sharing my love of playing with food on the blog. I knew I was trying to raise the level of personal testimony about plant-based eating and the clarity and healing it has brought me to the level of literary memoir, with a little art and poetry thrown in for good measure. I knew I was enjoying the heck out of having a platform to express my creativity and truth, about life, healing, art and food. I knew I was grateful beyond measure l am well enough to do it at all. But I didn’t know that by doing these things that come so naturally I might very well be expressing my own biological engagement with a deep rooted evolutionary purpose specific to this stage of my life. I was moved to realize that just by following and sharing the healing and fun of my accumulated food experiences and experiments, I am perhaps participating in the flow of a seamless pattern of evolutionary destiny–to help those who will come after me to eat wisely and live well. 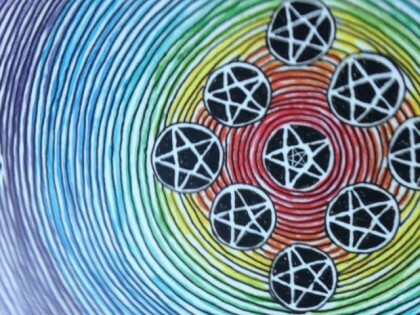 A pentacle stands for the “currency” of earth’s energy and the gifts of its material processes . 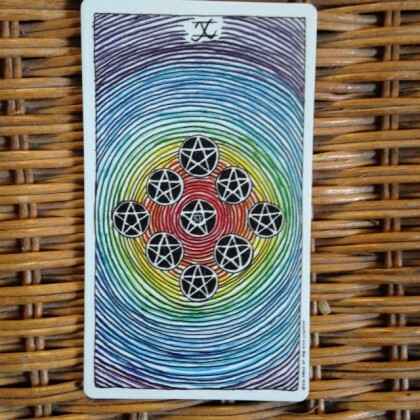 Some of the meanings of this card indicate things like “generosity” and “fulfillment.” When I looked at this card without my glasses on, I thought I only saw nine pentacles, or coins, and so I must be missing the “I” in front of the “X.” But when I put my glasses on I got a delightful surprise: there was indeed no “I” before the “X,” but in the center “coin” or “pentacle,” there was a pentacle within a pentacle. We often judge our activities by whether they seem to serve a purpose others will recognize and applaud. The older I get, the more I realize that true purpose is often imbedded in something so natural, so second nature, that it’s virtually hidden–until i look carefully, and can see–or at least glimpse–how what I do is part of a web of life so magnificent and beyond my own ideas of what purpose should be that I simply have to bow down in adoration at the mysterious beauty of it all. I love it when I learn from animals something true that helps me value my own human life more fully. So thank you to the scientists who worked to uncover the hidden menopausal wisdom of the orca whales, this pentacle within a pentacle. But most of all, thank you grandmother orcas. I celebrate your example with a confetti cole slaw. And now, for a little recipe “play”on this solid evolutionary foundation. my laziest effort yet: one tablespoon of Hoosier Farm’s Peanut Butter Powder (85% less fat than real peanut butter and no salt or sugar added), one tablespoon of Walden Farms Fat Free Sesame Ginger Dressing ( I bought it on sale, but it’s too salty to me to use by itself), 1-2 tablespoons of lime juice. Either mix together or do what I do: just put on the confetti cole slaw by the tablespoon-full and toss. Or use a dab of real peanut butter, lime juice, seasoned rice vinegar and grated or powdered ginger, and maybe a sprinkling of sesame seeds. Or you can pick a dressing from my previous recipes, if you like. And don’t forget a scoopful of rice or quinoa and your favorite beans. I like black beans or edamame in this confetti cole slaw. Thanks for sharing your wisdom and your simple, but profoundly healthful approach to food. Please continue to share abundantly your simple meal creations. Every day eating requires this simplicity, so don’t be shy about sharing your blessings. You are gifted in your creations and I have loved every meal I have ever created from you blog. We are not all talented in tossing simple foods together for a fine and satisfying meal. Specifically, in this case I like how you combine a dressing with great taste, but too much sodium with other ingredients so that it can be a part of an abundant topping. Thank you for your continued teaching … on food on life … you have learners out there. Maria, what a lovely post! My background is in biology, so I found the info on menopause in orcas especially interesting–I had no idea. I love this post, and the information about orcas!!! How fascinating. Salad dressing seem to be one of those things that can be difficult in this WOE. I’ve been trying out a pinch of xanthan gum or a little flax in my dressings, but I’m not crazy about the gelatinous texture that they impart. I’ve heard about the powdered peanut butter, and perhaps I’ll have to try it. I am not a peanut butter junkie, but I love it in savory things like salad dressings, gado-gado, etc. It seems as if the powdered peanut butter will be perfect for those applications. p.s. what I’m guessing in your salad is kale, green cabbage, purple cabbage and red peppers! And scallions!?!? Ha, not that it matters, but I think I’m going to have to make a salad soon with those vegetables. facinating post! Good to know there is purpose beyond menopause. Your recipe encoiurages imagination, well done. Fascinating post! Good to know there is purpose beyond menopause for women and orcas. Your recipe encourages imagination, well done.